We left Palmyra under much appreciated clouds. The weather had finally cooled down a bit and after some rain in the morning, we started having the weather we had hopped for. Low 80's, sunny during the day and cool nights. Our cruise that day took us a big 11 miles to Fairport. It's a cute village but their big claim to fame is the bridge. It was actually in Ripley's Believe It Or Not, which seems a bit extreme to me but I'm no engineer. It runs across the canal at an angle, connecting banks that are at different elevations and has no two angles the same on the whole bridge. While we were in Fairport I took advantage of the nice weather to walk along the old tow path. That's another great thing about this western portion. They've converted the tow path into a nice walking/biking trail. As I walked through a park along the way there were all these ducks on the path. They absolutely did not want to move. I nearly stepped on one. Their path, I guess. As the beautiful weather continued we embarked on another long cruising day - about an hour to go 6 1/2 miles - to get to Pittsford. Along the way we noticed the locust leaves were coating the canal. We hope this is just a result of the dry weather and not an indication of fall coming already. Pittsford is in the process of upgrading their canal front. We were using the only 30amp receptacles, but a guy from the parks dept. said next year they'll have more power and better docking. Joe gave him a card and the guy said he might call to ask his advice as they progress. Joe? Give advice? On the Pittsford website there is a walking tour map so we walked/biked the tour. There were some interesting houses and I was glad to see another cobblestone building since Joe had missed the first one. This one was originally a schoolhouse built in 1842. Now it's a Masonic Temple and was closed the day we were there so we didn't think they'd mind us trespassing a little. They've transformed some of the old structures in interesting ways in Pittsford This tall concrete building was a grain elevator, but is now an office building. There is another short tower that held coal - it's now a restaurant. We'd met several locals along the way who mostly discouraged a stop in Rochester, saying the dockage was in a sketchy area and there was "nothing" in Rochester. Since it was only a two mile detour up the Genesee River, we decided to check it out. We docked at Corn Hill Landing - a nice free dock with power in front of nice restaurants and condos. The area has old houses that went through a period of disrepair and being divided into apartments that are now being restored. It was a nice walk to the old downtown section that also featured some great old buildings. The Monroe County Building atrium was incredible. After a healthy walk we were rewarded with a view of High Falls. The Genesee River and its falls provided the power source to make Rochester the largest flour producer in the country for a time. The water power combined with the cheap transportation on the canal made Rochester a thriving industrial center. We were surprised to learn that many large corporations started there - Xerox, Kodak, Bausch &am Lomb. The one place that people had mentioned to visit in Rochester was the Eastman house. George Eastman, founder of Kodak (which is actually a made up word), had a mansion built in 1905 on some farm land in Rochester. We enjoyed the tours of the house and gardens and the stories about Mr. Eastman's life. An interesting story concerned the conservatory. The room was generally a cube shape and Mr. Eastman was not happy with the acoustics or the size since he often entertained. An organist came everyday and started playing the pipe organ at 7:30am when Mr. Eastman came out of his room and down to have breakfast in the conservatory. Mr. Eastman decided to enlarge the room - by cutting the house apart and moving one section over about nine feet. The original building cost for the house was about $300,000; the expansions cost more than $700,000. I mentioned earlier that people had cautioned us about the area we were docked in. We really felt pretty good about it with the restaurants' out-door seating areas close to the boat. However, our last night there I was awakened at about 1:30am by foot-steps on the fore-deck which is the bedroom ceiling. Joe went to investigate and sure enough someone was on the boat - a college age girl was posing on the deck as her friends took pictures from the dock. Joe told her to get off and she did - giggling the whole time. This is the first time we've ever had anyone on the boat - and this had nothing to do with the nearby sketchy neighborhood and everything to do with the nearby bars! The next day we cruised back down to the canal only to find a crew dismantling one of the old guard gates. As the sparks rained down on the canal, we pulled over to wait for them to finish removing a section. After a short delay we continued on to Spencerport - about a two hour trip including the delay. The last weekend in July in Spencerport is Canal Days - one of their biggest events of the year. On Saturday we shopped at the booths set up down the main street, listened to music, and saw belly dancers (??!! ), then walked through the town finding some beautiful old homes as we have in most towns. Sunday, however, was the big event - the Canaligator Race! More than 900 numbered canaligators (the alligator version of a rubber ducky) were dumped off the lift bridge and we all watched as they "raced" to the finish line - a boom with sort of a chute in the center. Volunteers snatched up the first six and the last six that all won prizes. One of our canaligators came in third! I'm sure it was due to the extensive training sessions we had beforehand. After all that excitement, the next day we moved a short way west to a quiet wall in Brockport. Brockport has one of the best boater facilities on the canal - and not a whole lot else. The downtown section does have some interesting old commercial buildings, but the walking tour of the town was not one of the best we've seen. I even did a long walk to Clarkson to see a few interesting houses but walk was mostly worthwhile for the exercise. Joe had picked up a summer cold and wasn't up for much activity anyway, so that after noon we went to the movies and saw Cowboys and Aliens - which we found quite enjoyable. The next morning was rainy so we decided to by-pass Holley for the time being and went all the way to Albion - about a two hour cruise. Albion's downtown has lots of old storefronts, but what we liked best were the churches. Seven of them built between 1830 and 1896 are clustered around the court house square. Besides the stories connected to some - like the disgruntled Baptist selling land to the Catholics on the condition that they position their church so that the Baptist church could no long be seen from Main St. - the buildings, mostly Medina sandstone, were interesting to look at. Unfortunately we couldn't get inside of any of them to see the stained glass windows from the inside. After peeking in some open windows in the Catholic church, Joe made plans to stop here for mass on the way back. George Pullman, who made his millions by inventing the Pullman railroad cars (likely patterned after the canal packet boats) built the Universalist Church which includes some Tiffany windows. Amazing what you find in some of these small towns! The next day we left Albion and headed for the next town west, Medina. The dark reddish brown sandstone that we've been seeing on many churches and homes was named for Medina. It's all been mined out now, but was used on the GW and Brooklyn Bridges and Buckingham Palace. On the way to Medina we passed two landmarks. 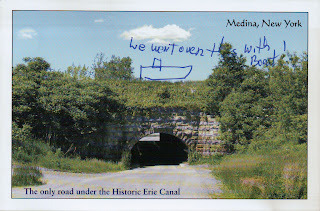 One was a sign telling us that we were at the northernmost point of the Erie Canal. It was surprising to see how far north of Rochester and Buffalo we were. The other one we really couldn't see from the boat, but the canal crossed over a road! We couldn't get a picture from the boat but we bought a postcard showing the tunnel on Culvert Road. Joe added the boat on top to avoid any confusion. As we arrived in Medina, the canal also passed over a creek. Once docked we walked to the opposite side of the canal to go see the falls in the creek we had crossed. Those of you who were with us on our loop may remember our disappointment in Healy Falls after making a big effort to see it, so we tend to be skeptical of water falls. This one was well worth the effort. Medina turned out to be a good stop. When we arrived, the weekly farmer's market was set up right by the dock. There were only a few farmers, but the produce was good, and there was also a stand for a vineyard - with wine tasting. Joe even bought a few bottles - including Fuji Apple wine. There is a Railroad Museum there that is huge! This guy started his collection at home and it finally grew to the point of needing a building. 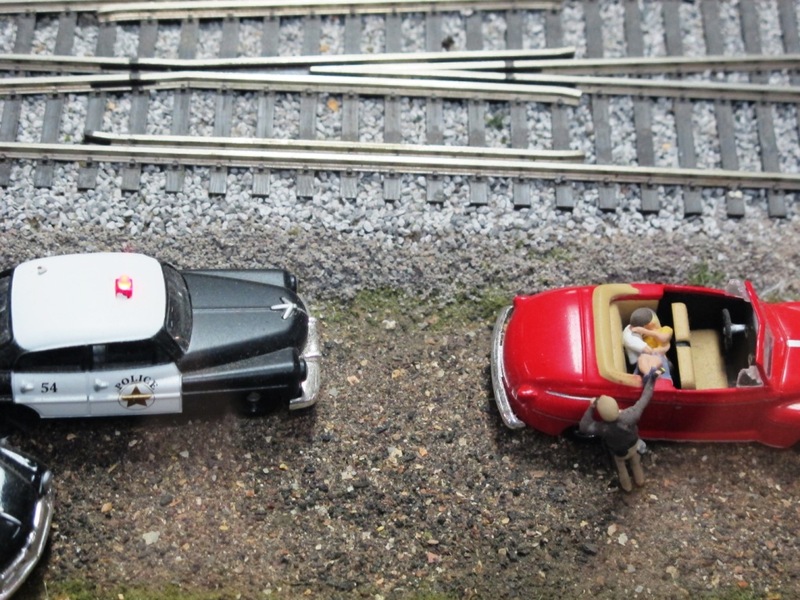 The whole train set up was amazing - and sometimes humorous. 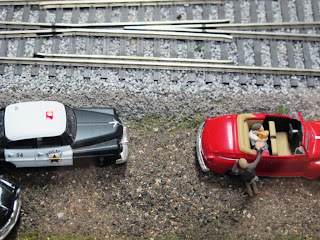 At one place the police have pulled over by a parked convertible. There's a couple making out in the backseat! 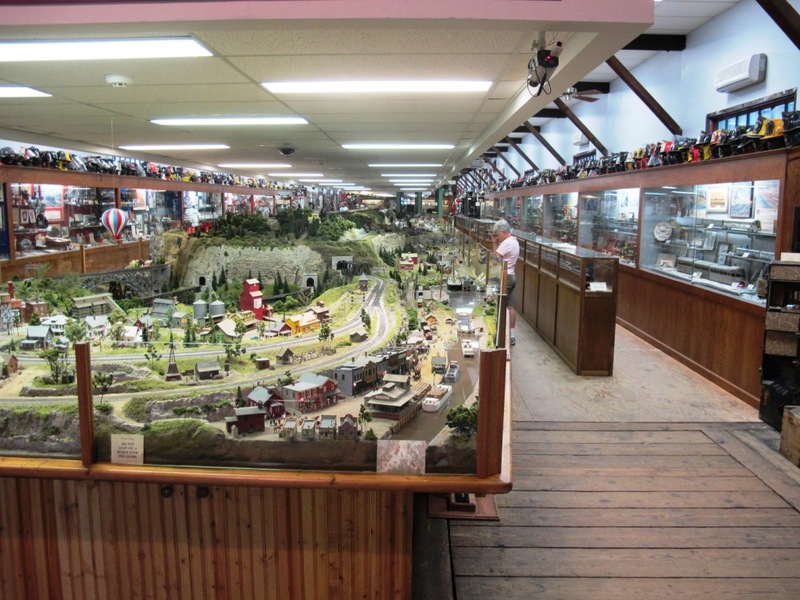 Besides all the train stuff, he's got a large collection of firefighter memorabilia, including a huge hat collection. After the museum we walked the town some to see some houses that were mentioned in our big book. One of them is for sale. This 4000 sq ft Italianate was built in the mid 1800's and has 5 bedrooms, 3.5 baths, 3 fireplaces, an attached garage and a two-story detached garage. And it can be yours for $289,000. We ended the day with dinner at Zambistro - which was delicious - and the espresso creme brulee - also delicious (thanks, Bettie!). Joe had generously decided to share his cold (although he kept saying I stole it), so now I was a bit under the weather. Since we had good power in Medina we stayed an extra day. Then we moved to Middleport, which didn't have much to offer, but stayed two nights. Joe toured around town some on his bike and I dealt with the cold. As we approached Lockport - and our final two locks - we could see old "flight of five" locks next to the two newer ones that replaced them. Good thing for us that they replaced them. Those were only 15' wide and Carolyn Ann is about 16' wide. After docking at the top of the locks, we set off to see the sights. Only a block or so away we went into a visitor center and learned about a nearby church with Tiffany windows that was open for tours. The windows were amazing. Six were designed and made by Tiffany and the others were made with Tiffany glass by another company. Part of the magic was in layering the glass to achieve the desired effect, but Tiffany also had the glass manipulated while being made to achieve the draping in the robes. Surprisingly, we were allowed to feel draped glass. The next day we moved on to Tonawanda. This will be Carolyn Ann's last stop on the canal as we will rent a car to tour Buffalo and Niagara Falls before heading back east. Great post and pictures, but then all your entries are an interesting read. Sterling Kennedy has some nice pictures of the Carolyn Ann on his blog.